The 50th anniversary of the Triangle University Nuclear Laboratory (TUNL) November 6-8 was a homecoming of sorts for hundreds of alumni, faculty and friends. On the eve of the anniversary party, Chris Gould of NC State inspected the trophy case at TUNL. For half a century, the three Triangle universities have collaborated seamlessly on nuclear physics experiments using particle accelerators and other equipment too large and expensive for one university to effectively use on its own. 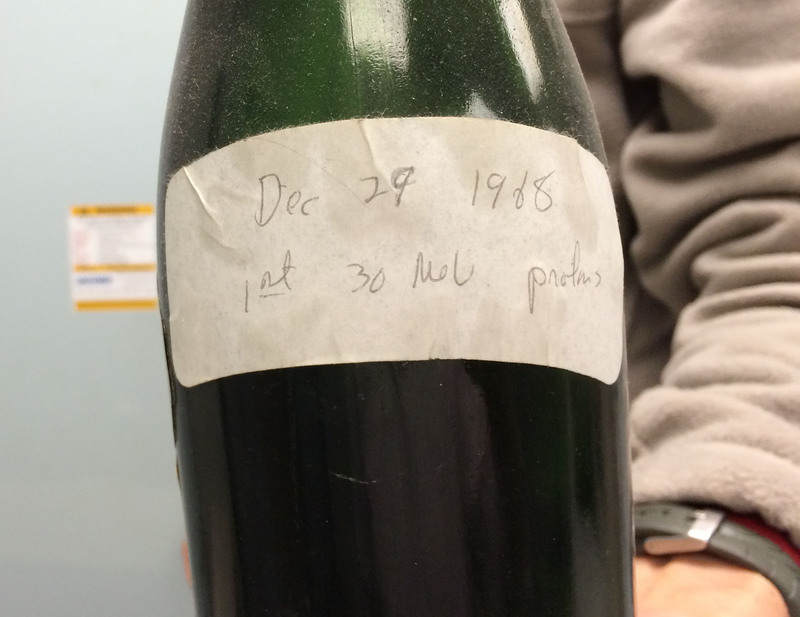 Key milestones in the lab’s history are marked by a dusty rank of empty champagne bottles marching across the top of a power supply cabinet in the basement lab. Each trophy bottle records a moment of celebration, when faculty, researchers, technicians, and students gathered to savor an achievement made possible by years of working all hours of the day and night to design, build, measure, adjust, repair, monitor, and make sense of equipment and experiments. Each is labeled, typically in Wite-Out correction fluid, with a date and the event. “The bottles represent technical milestones that either created new research opportunities at TUNL or increased the competitiveness of TUNL’s research activities in specific areas,” said Calvin Howell, who is a Duke professor and the director of TUNL. December 29, 1968, Roberson’s handwriting celebrates the first beam of 30 MeV, marking the end of two years of construction and assembly and the beginning of 50 years of science. Russell Roberson, Duke professor emeritus and one-time TUNL director, started the tradition. On Sunday, December 29, 1968, TUNL physicists successfully coaxed a beam of particles out of the new equipment, marking the completion of two years of constructing a new building behind Duke’s physics building and installing enormous equipment purchased with a $2.5 million grant from the Atomic Energy Commission. “It was a pretty big deal to have that beam and it seemed like we ought to remember when we did it,” Roberson said. Six months later, Gould began his career at TUNL. In the coming years, they would collide this type of beam (and others) with targets of various compositions in their quest to unlock the secrets of subatomic structure and forces. In the mid-1970s, TUNL began producing polarized neutron beams, in which the neutrons were all spinning in the same direction. Knowing the spin direction of the particles in the beam made for more precise interpretation of the data when the beam hit the target. 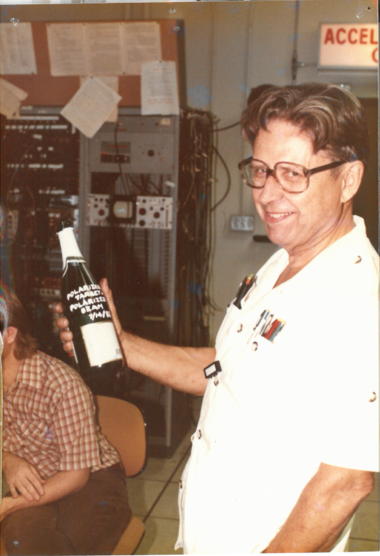 This bottle from 1979 marked a further enhancement—the beam was pulsed so that the speed of the neutrons in the beam could be calculated. TUNL operates the world’s most powerful Compton gamma-ray source, called HIGS (which stands for high intensity gamma-ray source). The gamma rays are produced in a free electron laser ring, which is housed in a 52,000-square-foot building adjacent to the original TUNL facility on Duke’s campus. In 2006, TUNL scientists added a booster ring called a synchrotron to increase the intensity of gamma rays that could be produced. Scientists from all over the world use the facility for experiments involving gamma rays at energies of 10 million to 100 million electron volts (MeV).